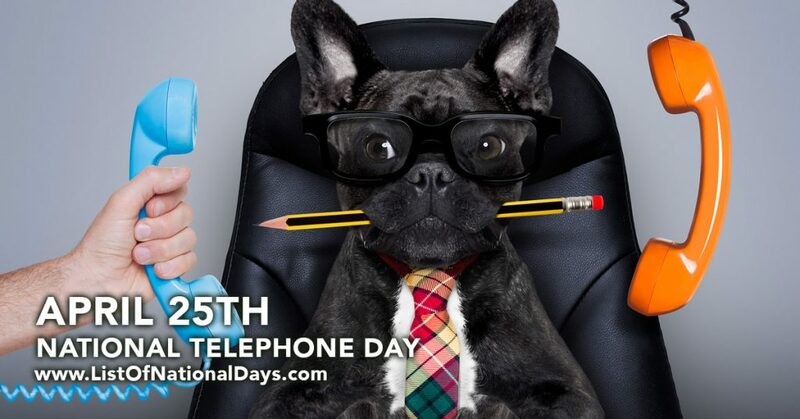 The history of National Telephone Day began before electromagnetic telephones were invented, mechanical acoustic devices were used to transmit speech over a distance greater than what direct speech could. The earliest telephone used pipes and physical media, but the acoustic telephone came soon after. This telephone was invented by connecting diaphragms with a piece of wire or sound. This transmits sound by using vibrations from one side to the other without using an electrical current. For a short period of time, the acoustic telephone was marketed as being a niche competitor when compared to the electric telephone. When Graham Bell’s patent expired, a lot of companies started to manufacture the telephone and acoustic phones soon went out of business. The electric telephone resulted from the huge success experienced by these companies. The telegraph was invented around the same time and the first electric telegraph was invented by Francis Ronalds in 1816. The modern-day telephone is actually the work of a lot of different people. Graham Bell was one of them. Johann Phillip Reis is a leading pioneer and he did a lot of work on the electric telephone that we know today, but he stopped shy of inventing the first, fully successful device. The Italian-American businessman Antonio Meucci has been praised for his work and ever since then there has been a lot of controversy as to who should take the credit when it comes to the invention of the telephone. So as you can see, the world has come a long way since the first telephone invention and now we have portable mobile phones, house phones and even video calling. We wouldn’t have National Telephone Day if we didn’t have the first invention by Francis Ronalds in 1816 with the telegraph or the invention of the analogue telephone by Graham Bell in 1876.